The Jacksonville Jaguars visit the Cleveland Browns in Week 11 of the 2017 NFL season. PFF previews the top player matchups of the game. RB Leonard Fournette vs. S Derrick Kindred – Fournette is coming off his least productive game to date, leading to his overall grade dipping to 81.0 (No. 15). However, he’s bound to bounce back given his early season production. Fournette has forced 27 missed tackles but will have his hands full with Kindred opposite of him this week. Kindred’s 88.7 run-defense grade is fourth among safeties. To go with it, Kindred’s run-stop percentage when lined up within eight yards of the line of scrimmage of 10.8 leads his position. On the opposite end of the spectrum, his seven missed tackles in run defense are the most among safeties. Fournette being labeled as questionable throws into doubt whether this matchup will get to occur. T Cam Robinson vs. Edge Myles Garrett – Robinson has had the typical ups and downs of a rookie tackle. His overall grade of 38.3 ranks 72nd at the position, but he has been slightly better in pass protection. He has recorded a pass blocking efficiency of 92.5 (63rd among tackles) so far this season, having allowed 28 total pressures on 285 pass blocking snaps. Despite injuries limiting his availability, Garrett has flashed the skills that made him the No. 1 pick this past April. If he had played enough snaps to qualify, his overall grade of 80.5 would rank 34th among edge rushers. To this point, all of Garrett’s 87 pass-rushing snaps have come from the right side, and he already has 15 total pressures to show from them. A big performance from Robinson will be essential in keeping a clean pocket for Blake Bortles. 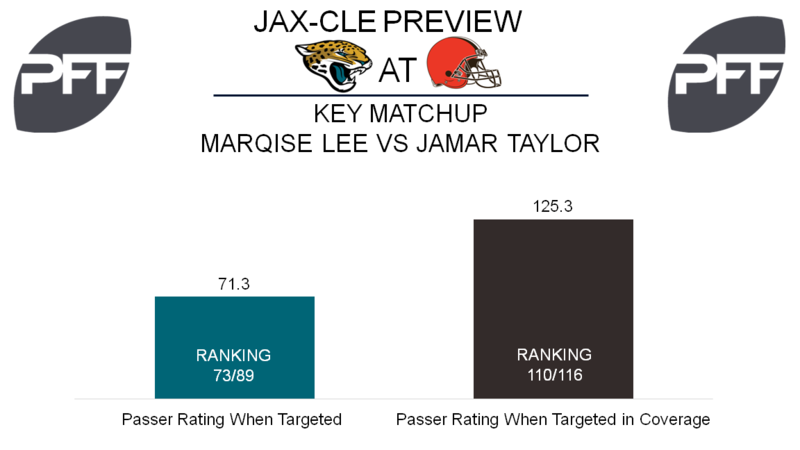 WR Marqise Lee vs. CB Jamar Taylor – Despite the Jaguars being a run-first offense, Lee’s 38 targets since Week 6 are ranked ninth among receivers in that span. Contrary to previous weeks, Lee ran the majority of his routes from the right side last Sunday. If the trend continues, Lee would see a lot less of Jason McCourty (currently PFF’s second-ranked corner) and more of Taylor. To this point, Taylor’s overall grade of 54.6 ranks 80th among corners. His 1.67 yards allowed per coverage snap checks in at 104th, while his passer rating when targeted of 125.3 is 110th among qualifiers. Also noteworthy is that Lee, since Week 6, has racked up 140 yards after the catch (sixth-most in that span), while Taylor’s 274 allowed after the catch is the most at the position. Browns tackles vs. Jaguars edge rushers — With Joe Thomas sidelined for the remainder of the season, what was expected to be one of the league’s top offensive lines before the season is now left wanting at both tackle positions. Spencer Drango (LT) and Shon Coleman (RT) have combined to give up 47 quarterback pressures on 495 pass block snaps this season, with both players ranking among the bottom 20 tackles (of 78 qualifiers) in pass-blocking efficiency. Coleman left last week’s game with a concussion, and if he’s unable to go the Browns will roll with rookie Zach Banner, who surrendered two pressures in 20 pass-blocks snaps against the Lions. You might’ve heard, but the Jaguars defense has been pretty good at pressuring the quarterback this season. 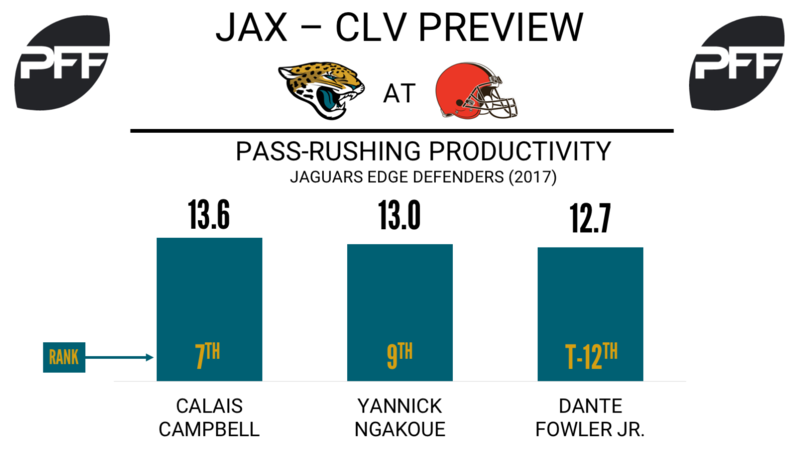 Among 106 edge defenders with at least 100 pass-rush snaps, Calais Campbell (seventh), Yannick Ngakoue (ninth) and Dante Fowler Jr. (tied-12th) all rank among the top 15 in pass-rushing productivity. WR Ricardo Louis vs. CB Jalen Ramsey — One can dream of watching Ramsey and Josh Gordon battle it out on the outside this week, but alas, it should be Ricardo Louis drawing the unfortunate assignment of getting open against one of the league’s premier cornerbacks this week. Ramsey has been lights out this season, and his 10 combined interceptions and passed defensed makes him one of just three cornerbacks who have gotten their hands on double-digit passes. Cleveland has struggled to get much production out of their wide receiver group this season, and Louis, the team’s most targeted wide receiver (46), has been no exception. Louis is averaging 1.03 yards per route run, which is tied for 72nd among 89 qualifying receivers. QB DeShone Kizer on passes to the middle of the field — Kizer is coming off his best game as a pro, earning the third-highest overall grade given to a quarterback last week (86.1). The rookie quarterback was able to find success throwing over the middle of the field, completing 5-of-6 passes for 77 yards on throws beyond the line of scrimmage. Repeating that success will prove incredibly difficult this week against a Jaguars defense that has been excellent defending the pass regardless of how you slice it. On throws between the numbers, Jacksonville is allowing the second-lowest passer rating (71.1) and the fourth-lowest adjusted completion percentage (72.6 percent).